Yesterday, September 29, The Friar's Club honored legendary comedian and humanitarian Jerry Lewis with a Lifetime Achievement Award. Quentin Tarantino was on hand to present Lewis with his honorary bust. 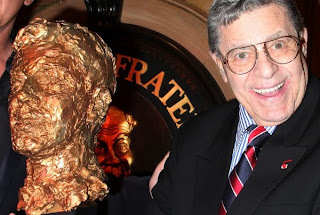 Jerry Lewis is best-known for his slapstick humor in stage, radio, screen, recording and television. He was originally paired up with Dean Martin in 1946, forming the comedy team of Martin and Lewis. In addition to the team's popular nightclub work, they starred in a successful series of comedy films for Paramount Pictures. As an innovative filmmaker, Lewis is credited with inventing the video assist system in cinematography. Lewis is also known for his charity fund-raising telethons and position as national chairman for the Muscular Dystrophy Association (MDA).